The Message Bar Web Part is a SharePoint client side web part built with the SharePoint Framework (SPFx). 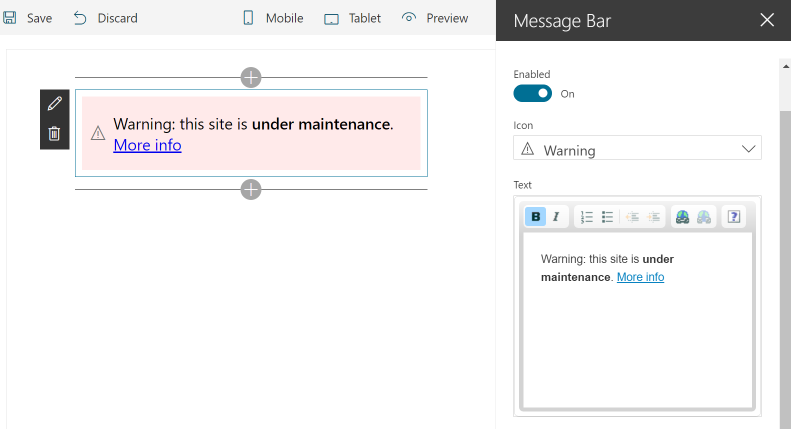 This web part adds a Message Bar to your SharePoint pages, for example to display a warning or error message. With this web part you can preconfigure your messages, manage the icon, the text, the layout options and enable it when you need to display the message. This web part is very usefull to display a site maintenance status for example. This web part uses the Custom Fields library to enhance the web part edition experience.